New here, so please forgive me if the formatting here isn't how people normally post, but I wanted some feed back on a sentai/power rangers series idea I had. The theme would be based on western super heroes, with the opening following a very Superman like character in something akin to the MagiSol/Solaris Knight's outfit but with mostly red and blue. After showing that he's the main hero of the city and an agent of a government group that developed him to defend the world from monsters, he encounters a character who is analogous to Darkseid, a cosmic dictator from another world. In a battle, a weapon discharge causes the character to be split into two beings, Red and Blue, as an homage to the Superman Red and Blue stories from the 60s. The characters' abilities are halved, so they're both vastly weaker and unable to fly or use most of the energy abilities that once came naturally. 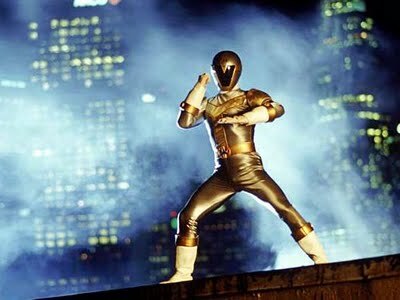 A black ranger, designed to resemble a kakuranger/alien ranger, appears and destroys the portal that the despot was coming through, forcing a retreat. After the battle, Red and Blue confront Black and discover that he's a member of the same government program and it's revealed that there have been several rangers who were less powerful prototypes. With this new threat attacking Earth and the main hero substantially weakened, the program is brought back. At first, Red, Blue, and Black are teamed with a white ranger (modelled after Jetman's white ranger), who is equipped with wings to fly with, and a yellow ranger (modelled after Timeranger/Timeforce), who can create forcefields. The forms the initial five person team. Later, their mentor, who is revealed to be a telepath, becomes a green ranger (looking like a green Akaranger) and a female, heavily armored silver ranger (looking like a female Wolzard/Leanbow) is created. Basically it's a tribute to the Justice League, but I thought that splitting Superman into Red and Blue and making them a pair of quarreling co-leaders would be a cool twist. 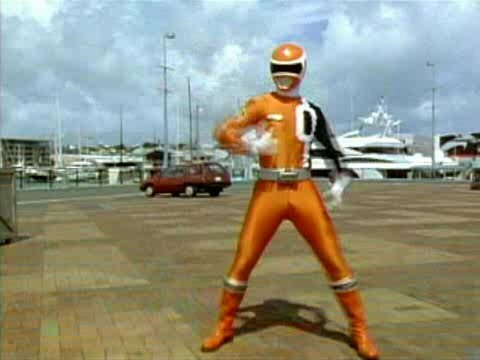 They'd all have unique powers like in Go-Onger/RPM, each as tribute to classic super heroes. I am not great at writing so i'll try my best! I thought this would be a cool idea for a Anniversary season. Season Theme: Time Travel...Find the Past to save the Future. The Outline: In the year 2075 a government lab has finally created time travel and wishes to use it to help undo many of the worlds problems. With this new technology they call upon 3 young Archaeologists to travel to the past to find 10 powerful items that can save the future. The Team: 3 Historical Recovery Hunters that travel to past in order to find powerful ancient artifacts that were lost long ago. They have white wrist changers that have a clear touch screen on the top that they can use to Morph, Communicate and Time Travel. Red: The leader who is quick on his feet and is very similar to Indiana Jones. Blue: The shy tech guru that is deeply in love with Hannah. Light Green: The Brains of the group and a skilled swordsman. The Lost Weapons of a Time: All of the Rangers weapons would be artifacts from the past that transform and add armor to each of them. The first set are the 3 Royal Blades that add Knight-like armor to each Ranger who wields them. 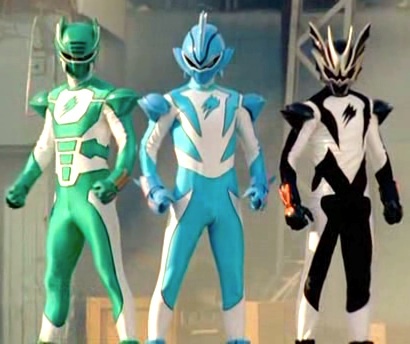 The Royal blades unlock the Red Phoenix, Green Griffin and the Blue Wolf Zords. The second set are the 3 Shogun Swords that add Shogun armor to each Ranger and unlocks the Red Dragon, Green Panda and Blue Tiger Zords. The 3rd and final set are the 3 Battle Weapons: Red Ax, Blue Mace and Green Spear. They form Gladiator armor with shields and unlock the Red Fighter Zord with a Chariot and the 2 Horse Zords to pull it Blue & Green. They form The Champion Megazord. Gold Pharaoh Ranger: An arrogant but power fighter who butts heads with Matt on leading the team. His changer are twin power Braces his weapon is the Pharaoh Saber and his Zord is the the Sphinx that can transform into the Sphinx Battle Megazord. Grey Cowboy Ranger: A wise cracking sharp shooter that is always ready to save the day. He has a crush on Hannah witch bugs Chris. His Changer is an old chain watch and his weapons are two Laser Revolvers and his Zord is the Buffalo Carrier Zord. The Villain: An evil Archaeologists (Dr. Trome) that wants to travel to different points in ancient history to steal powerful artifact so that he can re-write history and become the ruler of all time. He uses evil items he finds to unlock monsters and foot soldiers. The Mentor: Prof. Bloom is a very strong and bright woman and wants to use time travel to save the world. She also transforms the artifacts the Rangers find into powerful Weapons and Zord to aid them in their fight. This team can also travel to the past to get help from different Ranger Teams from time to time. So there you go. If anyone would like to build a good story around this Idea be my guest. Last edited by Dinorider37; June 5th, 2013 at 11:43 PM. I made this idea years ago. The name of the team is Power Rangers: Storm Strike. The team is based off the elements. It kind of has a similar feel to Avatar: the Lost Airbender. The story goes that there were an ancient race of humans that controlled the elements: water, fire, earth, lightning(electricity), and wind. Then one day a force rose called the Shadows because they rose from the shadows, and sought to darken the skies, to cover the earth, and eliminate all life. 5 warriors were chosen from each elemental tribe. They were able to seal the threat away, but unfortunately with the loss of the warrior from the lightning tribe. As time went on, crystals that they wore were passed down parent to child, until we came unto a time when the need for a team was needed again. The shadows did arise again, and so a team is assembled. King Ogohn and Queen Vada: The mentors of the team. They preserved themselves in order to help the team that would arise to defeat the Shadows. They are actually young. Think mid 20's. King Ogohn is from the fire tribe, and Queen Vada is from the water tribe. Maria: Yellow Ranger of the lightning tribe. She is a tech genius with a quick, witty, and sassy attitude. She gets into a relationship with Alex. She learns to control lightning, and light. She gains the cougar zord, and the eagle zord. Her zords form the Gryphon Lightningzord. Sara: White Ranger of the wind tribe. She is a quieter, but bold girl that Jarrell gets along with really well. She has to gain confidence in herself as the fight continues. She learns to control the wind, and to become a part of the wind. She gains the falcon zord, and Garuda zord. They combine to make the Seraphizord. Tohru: A guardian that was born of the earth tribe, but was not born with the ability to control the element. He however was given the power of super strength. He stayed awake for centuries in order to awake the king and queen when the Shadows returned. He later becomes the Sohei Ranger. He gains the panda zord, crane zord, and monkey zord. They make the Sohei Megazord. Emperor Darkness: He is the leader of the race of creatures called the Shadows. He creates creatures by using the shadows of different things, which actually takes some of their life force. Before the end of the season, we find out that Emperor Darkness, is actually the original lightning warrior. He gave in, and then took control after learning how to control the dark powers. i wanted to start with 2 Rangers ! YEAH JUST Two ! ok the show/Series/Season would be called: Power Sentai: Time Slash ! Haley Conrad is going to University like every other Day and is having an Car Crash. When she wakes up.. She is not at Home anymore and tries to find her Way back home. She tries to remember what happened during the Car Accident and how to get Home. Haley finds an new friend in... CASEY RHODES ( Jungle Fury Red) and finds out where she is and is realy confused. Haley isn't sure about trusting Casey but he can convince her to trust him and shows her who he is: The Red Ranger of the Jungle Fury Rangers ! Haley and Casey are working together to get Haley back home and has to learn the Fact why Haley was sent back in Time to 2013 and have to fight together to bring Haley home and to save Casey's World and Haley's Future... Both will get involved with some new and old Friends who are helping out and get involved in a New Power Sentai Team which they call: Time Slash ! Together they are try to find out what's going on and how they can survive ! Jason Smith as Casey Rhodes: (Red Time Slash Ranger): Casey is the Previous Red Ranger and Leader of the Power Rangers Jungle Fury and finds Haley and get involved in her Adventure and is fascinated by her. both are become friends and Casey reveal his secreat to her that he is an Previous Power Ranger. He helps her during the Season and is trying to reconnect with his former Cast Members Lily & Theo but can't reach them and later he finds out why. Casey can't use his Jungle Fury Power anymore because of the Time Slash. But the Time Slash gives Casey & Haley NEW Power to survive. Naoya Makoto as Tsuyoshi Kaijou (Akarenger): He becomes the Mentor of Haley & Casey during the Season and can't fight as Akarenger because of the Time Slash. Tsuyoshi was working on an special Project to defend the World of the Time Slash and has created a New Power of this Time Slash which he gives to Haley & Casey after he finds out that Haley was sent back in Time. Later it is revealed that Tsuyoshi already knew that Haley would come back in Time and The Rangers finds out why. 3 New Rangers will coming later during the Season and will not get revealed right now. Francis Boulle as The Time Slash: The Time Slash is an Psychotic and verry dangerous Guy who calls himself The Time Slash because of his fascination of Paralell Dimensions and Time Travelling and other SyFy Interests. He has no friends and his Parents are always working and he always tried to get recognised and respected and so The Time Slash creats an Time Slash to destroy other Timelines and Paralell Dimensions to earn the respect he deserves and to become the most dangerous, respected and feared Villain when he can't get what he wants in the friendly way. he knows about the Power Rangers and Sentai and wants to destroy all timelines and other Dimensions to lock them up before they can stop him like all the other Villains of the Decades ! The Lonley Girl: The Lonley Girl is an Lonley Girl who was find by The Time Slash during his working on creat the ultimate time slash and is using her as his Friend and help for his Plans to become the most feared Villain. The Lonley Girl helps him because he's so nice to her and get her the comfortable place she needs in the moment because her parents got killed. Later its revealed that The Time Slash who was Created by TS killed her Parents and The Lonley Girl blames TS for it and leaves him to get revenge ! Lynn Mozimret (red): Age 23, Brave and courageous, but acts shy around others to hide her identity as a ranger. Darwin Cyrillis (blue): Age 20, Medieval Fanatic, know-it-all. Clay Mozimret (yellow): Age 16, Lynn's little brother, energetic and annoying. Hailey Q. (lime): Age ?, Constantly cracking jokes. Very clumsy. Chet J. (purple): Age ?, Talks really really fast all the time. Quinn Caramore (orange): Age 34, British, Brave and a Genius. Zords would be, (Chūsei Knight/Knight Megazord=Red Knight[torso,head]+Blue Horse[Right leg]+Yellow Lion[Left Leg]. Chūsei King/Guardian Megazord=Lime Harlequin[Left Half of body]+Purple Jester[Right Half of body]+Orange Crown[Head]. Last edited by Nova!Vamola! ; August 1st, 2013 at 01:54 PM. Find More Posts by Nova!Vamola! After having discovered that he had abnormally high scores in a balance and coordination test, Sam was given the Moon driver and the Moon walker music soul (looks like an old cassette tape & plays MJ's billie jean), bythe Jackson Music Research Foundation. By inserting the tape into the buckle of the driver and spinning the mirror ball in the center, he is equipped with a lightly padded, white suit, a helmet with blue eye lenses, and (rather unusaully) a fedora & cocktail jacket, both white. one of his two gloves looks like some sort of metal-flake fabric. When his father, a top scientist, was killed in a terrorist raid of the JMRF, he went on a revenger quest. He stole the Scream soul (play's MJ's Scream) back from the terrorists, and built his own driver based off of blueprints that he fond in his dad's home office. After inserting the soul into it's slot and pressing play, Chaz is equipped with a lightly padded, black suit, a black helmet with green eye lenses and a leather jacket. tools: The Scream driver doubles as a large hand gun. tools, a spiked flail dubbed, "Will Breaker"
I want so bad a TRUE Team up with the TMNT and Power Rangers in Space. No Venus de milo, she's disgraceful to the Turtle Franchise. However this time it should be set in New York City. The Rangers are led to the City while following an evil Robot that was developed on KO-35 many years ago during the prototype stages of the A.I. DECA. The scientists wanted to be able to give all of the people of the planet a Humanoid Robot with a sophisticated system to help assist them with their everyday lives. However the prototype was sabotaged by a mysterious villain. When the First Robot was activated it became self aware and was reprogrammed to eliminate beings of higher intellect. Realizing it was In a room full of scientists it destroyed the facility In a manner of minutes. The robot than found an early version of the Astro Megaship and continued to leave the planet looking for more intelligent lifeforms. After many years the surviving scientists of the planet KO-35 could not locate the robot or the ship, assuming that the prototypes were not ready they hypothesized that they were non functioning in deep space. Fast forward to the very first prototype of the Astro Megaship arriving over the buildings of New York City under a cloaking device. In the ship you see smaller robots scanning area for advanced life forms. The scan reveals no human life form of substantial IQ. Just as they take off the scanner changes frequencies and comes back with a hit. The screen reveals an Amphibious lifeform under the city's concrete and asphalt. I could go on but basically they find Donatello in New York and want to capture him. The ship deploys smaller robots to the sewer to flush out Don. Only the Rangers have sensed the Ship in New York be cuz of the signal it's giving off. Andros and Zhane tell the other rangers the story of the " Lost Megaship". They proceed to the city to investigate. Ultimately leading them to the sewers to find the Turtles and Splinters fighting dozens of small robots. They help the Turtles fight them and destroy them with a combination of the Quadro Blaster and Zhanes Super Silverizor. Stunned to find the Ninja Turtles being real they tell the TMNT to come with them topside to the ship. I've never written this before about this, I'm just spitting all of this out here at once. Let me know what you like. That is too cool. And 1000 times better than the actual team-up. I had an idea based on the un-used "Hexagon" concept here: http://goo.gl/yvz3M1. But it took me too long to fill in the gaps, I and kinda dropped it. I may pick it back up now. Last edited by Mitch FIN Keith; September 22nd, 2014 at 05:54 PM. Basically the morphers would be phone esque where they have to input #Ranger on the Morphing Grid app for them to morph. With the individual call being "Red Ranger Log on!" I'm a classic fan so we will bring back it's morphing time as the call. I just think it would be perfect for the social media world we are now that the kids are all about. Two bulk and skull like internet trolls. Bad Guy kind of like a Wikileaks type hacker. Teenagers with attitude for the new age. Zords keep it classic animal esque but still apps. Everything would be an app. I'll design a logo soon. My body is falling apart! I was thinking about writing a story that doesn't focus on the actual rangers, but instead focuses on the various engineers and staff that help keep the operation running. Despite not being the public image of the power rangers, they often face threats just as dangerous. Last edited by Con Air on VHS; April 5th, 2014 at 12:00 PM. I was thinking about wirting a story that doesn't focus on the actual rangers, but instead focuses on the various engineers and staff that help keep the operation running. Despite not being the public image of the power rangers, they often face threats just as dangerous. Hmm that actualy sounds cool. I am definitely intrigued. I'm thinking of a PR AU where Charlie and A-Squad did not become evil because Boom is a fellow Ranger. Ryan Mitchell is a US agent liason to SPD Earth and commander of the Rangers on Earth. Sort of like Amit's Hexagon. The Spirit Rangers are Order of the Claw students that has the Animal Spirits of the Pai Zhua masters. They also work alone and is not a fan of government regulated rangers. Sentinel Knight gathers these Rangers together to fight United Alliance of Evil Remnants led by Thrax, Machine Empire generals Atomon, Steelon and Tezzla and the Mut-Orgs. Basically PR-exlusive anniversary crossover villains each side representing Science/Mechanical and Mystical/Biological types in PR. R.I.C. 3.0 Team cannon and Battlizer for the Orange Ranger. Zords- Sentinel Knight gives both groups their Zords based on the MMPR zords. The Megazord is piloted by the A-Squad Rangers while the White Tiger Zord is piloted by the Spirit Rangers. Silver Titanus which also serves as baseship is both piloted by the Titanium Ranger and Orange Ranger. Titanium Ranger piloting the Shuttle Zord section while Orange Ranger drives the Carrier Zord section. Why these Zords well they are a pair of what ifs that Saban could've taken for the show. Zyu3 zords for MMPR. 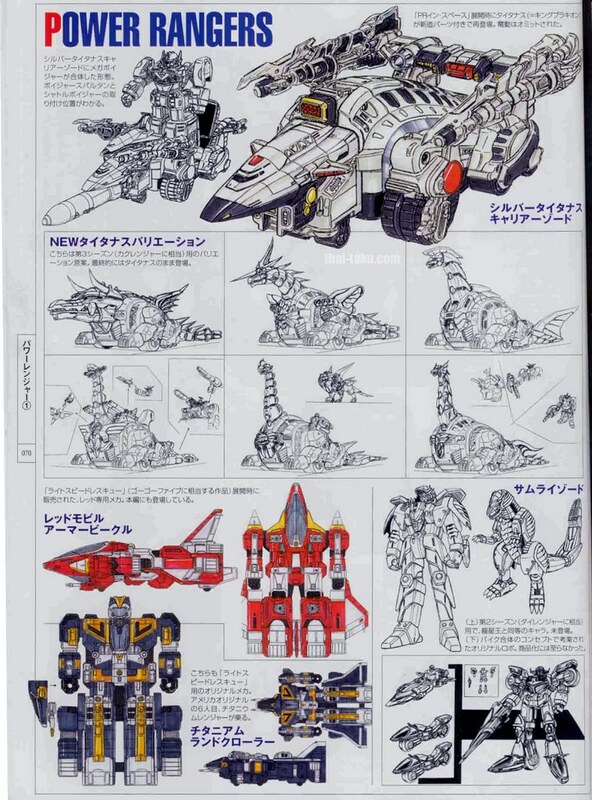 If Countdown to Destruction were to have three parts Silver Titanus would have appeared in the finale. Five teenagers are killed when an alien spaceship comes down and attacks the planet. Now, brought back to life, they must utilize the power of the elements to defeat said aliens and prevent them from destroying the planet. At some point, it would be revealed that Zordon somehow brought them back to life, because he knew that this would happen. It's also revealed that the main villain is the daughter of Rita and Zedd; named Sylvia. Later on, two new rangers start working for Sylvia, but soon join the side of good. Before the finale, Sylvia defects to the side of good after learning she was manipulated by some Evil In A Can. She becomes the Violet Ranger. They all have zords, too. The season finale will lead into a sequel series, named Kabuto Force. With the relaunch of PR, it got me thinking. So here is my new team..
5500 years ago a group known as the Triskelion utilized dark alchemy to achieve incredible power. Driven to consume human spirit energy to sustain themselves, the Triskelion declared war on the rest of humanity. To combat the Triskelion and their horde of Haploid foot soldiers and Zygote monsters, the greatest alchemists banded together. Combining their skills, the alchemists infused a handful of warriors with incredible power in the hope that these champions could destroy the Triskelion threat. These warriors, infused with increasable powers also commanded enormous living statues to combat the Zygote monsters. Unfortunately the Triskelion proved too resilient to be destroyed, so instead the champions and alchemists resolved to trap them in a pocket dimension known as Zero Space. Sacrificing everything, the alchemists and their champions were able to finally imprison the Triskelion. The wisest of the guardians knew that eventually the Triskelions would find a way to escape Zero Space so he charged his daughter Pandora, to watch over Zero Space and wait for the day the forces of light would be needed again. Pandora was sealed away inside the same dimensional pocket as the Triskelion, waiting for the day when the world would need her guidance. Locked inside a cuneiform cylinder, millennia passed by without incident and Pandora stood watch. Pandora's mission to stand vigil over the Triskelion would eventually give rise to the myth of Pandora's box. An ancient box containing the evil of the world. That when the box was opened and the evil escaped the only thing remaining inside would be hope. Jumping forward almost 5400 years to the 1910's Middle East, archeologists found Pandora's box and several other artifacts sealed within an Arkkadian tomb. The British museum moved the contents of the tomb and stored them safely away for another hundred years. However, several tomb raiders had plundered the tomb prior to the British archeologists finding it, scattering the treasures and mysteries around the globe. Only the Box itself remained completely intact. It is the year 2014 and Pandora's box is part of a North American museum presentation travelling from state to state. The Newport Bay's Museum of Natural History is currently presenting a display of ancient world artifacts, of which Pandora's box is one of the items. As school children file past the display, Mercury, Venus, Earth and Mars come into a rare planetary alignment. The unique gravity well created by the alignment breaks the seal on Pandora's box and allows three of the Triskelion's to escape Zero Space. Realizing that the time is right, Pandora releases the power she has guarded for over 5000 years in order for new champions to be chosen. Primary Elemental Rangers: At first only five rangers are immediately selected. Each Ranger representing the spirit of an individual element within Alchemy, Earth, Fire, Water, Earth and Thunder (Ether). These five Rangers represent the core of the team. Red Ranger - the Spirit of Fire. Jake - High school Senior. He is an only child, his younger brother passed away years earlier of cancer. Jake secretly feels guilty for not being able to save his little brother. Responsible, dedicated and adaptable (to situations) however is guilt over his brother prevents Jake from being the strong leader he was born to be. Orange Ranger - the Spirit of Thunder - Lincoln "Link" - High school G11 - Link has an older brother serving in the military that he worries about constantly. To take his mind off of his brother Link throws himself into his work/hobby - cars! He is a mechanical genius with a natural affinity for technology, without the typical "geek" status. Link has a chip on his shoulder that presents itself as a slight temper. He will sometimes over react and jump into a situation without thinking it all the way through. Yellow Ranger - the Spirit of Wind - Lana - High school Senior - Strong and independent, Lana often comes off as aloof. She is observant and smart with a very analytical mind. She can often make well educated guesses that pay off. Lana has decided to see a little of the world and wants to take a year off school before she attends college. Lana is the only child, her father is a pediatrician and her mother is deceased. Green Ranger - the Spirit of Earth - Aiden - High school G11 - Aiden has a younger sister, Madison. He is older than her by about 5 minutes, but in his mind that still makes him the "big brother". He is protective of his sister to a fault. He is very athletic and loves hockey and lacrosse. when Aiden was 5 he nearly drown in a friends pool, ever since he has had a phobia of the water that he does his best to hide. Blue Ranger - the Spirit of Water - Elisa - High school G11 - strong willed and energetic. Elisa knows what she wants and goes after it with zeal. She is always on the move, sometimes that means she goes over or through other people. She never means to be rude or over bearing, but her drive gets the best of her. Loves to dance and go kayaking. She is not the strongest team player, but a quick lesson in cooperation will teach her the value of cooperation. Secondary Essence Rangers; the secondary Rangers appear later in the series one at a time. Each brings with them access to a new Zord and a new Megazord combination in answer to a specific threat or need. Indigo Ranger - the Spirit of the Lake - Kara - High school Senior - Kara is the typical "girl next door" type with a heart of gold. She is going to college to become a paramedic. She is smart, outspoken, calm and resourceful. She has a love for nature and animals, spends her free time hiking and likes to play tennis. However her home life is not perfect, her parents are constantly at work and pay very little attention to her, because of this she has developed a bit of a need for acceptance and praise from others. Secretly she lacks confidence, but manages to conceal it with her intellect and resourcefulness. Violet Ranger - the Spirit of the Mountain - Finn - High school Senior - Smart and wise beyond his years. Finn, an only child, loves to play chess with his father, this has given Finn a tactical and analytical mind. He is on his way to college with a full scholarship, studying the geology and the environment. He likes to rock climb in his spare time. If Finn has a fault, it is his clinical nature, some would call him cold. His analytical mind tends to present itself as detached and cold, a character trait that Finn would like to overcome because it has in the past made personal connection difficult for him. White Ranger - the Spirit of the Sky - Madison - The younger sister to Aiden. Madison has two passions, school and painting. She is bright, creative and artistic with a great eye for beauty and detail. She tends to see the bright side to any situation, often providing positive support even in the worst circumstances. Madison is the only person that knows Aiden is afraid of the water. Sanctuary is the PR base of operations and is located within the same pocket dimension that Pandora resides in. The chamber is a large, roughly cylindrical shaped room with a suspended walkway/main floor. Located off to one side is a large portal that connected Sanctuary to the real world. Crossing a walkway from the portal to the center console, an eight sided control center. Various controls and displays are mounted on the central console, most written in an ancient script or sigil that cannot be easily read. Each of the eight sections of the console matches one of the spirit elements (colours and symbols, etc..). The console has a socket for each Rangers Lance (special weapon hilt) where is eventually upgraded. A small port in the top/center matched the outline for their spirit rings, activating the port infuses the console with their energy. Alchemy symbols and sigils cover most of the controls and surfaces of the chamber. A swirling energy vortex can be seen underneath the main chamber, it is the heart of Zero Space and the pocket dimension Pandora occupies. Two additional walkways connect the center console to the outer wall, both lead out of the main chamber and are "off camera". The walls of the chamber of obscured by shadow, but alchemy sigils and symbols can be seen carved into the walls themselves. The back wall of the chamber, opposite the portal/walkway is the main viewing screen. When not in use the screen appears to be part of the wall, images seem to float just above the surface suspended in mid air. Pandora can only exist within Zero Space, if she returns to normal space/reality time will begin to catch up to her, resulting in her ageing 5500 years (and killing her too). Pandora is a young and beautiful woman in the prime of her life. She is patient, wise and generous with a strong maternal instinct. She maintains Zero Space and the prisoners it contains, knowing full well that she can never leave. In order to survive Zero Space, Pandora was transformed in a manner similar to the Triskelions, with her essence merged with living stone. She has a pale white appearance and wears natural flowing white and grey clothes. Her stark white hair is pulled back and in a pony tail. 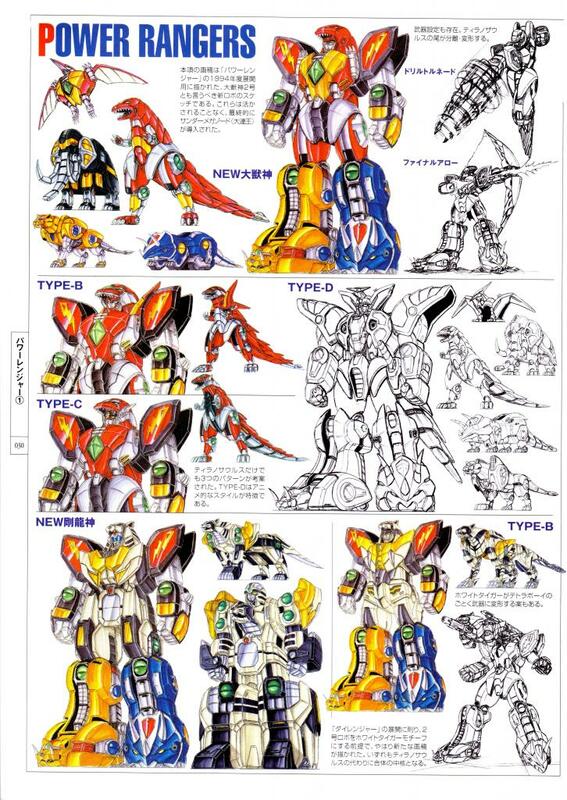 The 5 primary rangers can combine their Elemental Zords to become the Spirit King Megazord. 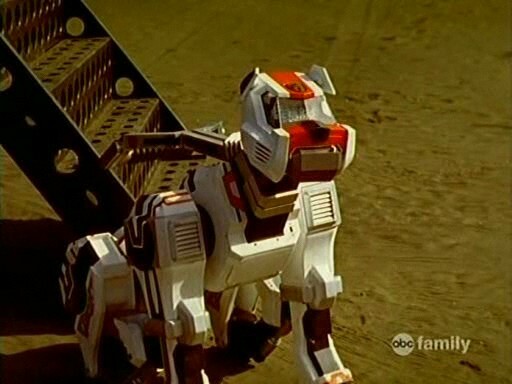 The Lion Zord forms the head and chest of the Megazord. The Lion Zords front lets fold flat and rotate back to lock, the lower legs fold at the knee to create the upper thigh of the Megazord. The head of the Megazord is concealed within the mouth of the Lion, its lower jaw ions’ to reveal the Spirit King Megazord head. The Wolf and Cheetah Zords form the left and right arm of the Megazord, with the chest of each zord opening to rotate the Zord head in and a articulated fist out. The chest then closes locking the hand out. Abdominal plates slide open to reveal the elbow joints. The Rhino and Bear form the legs of the Megazord. Their rear lags fold flat against the body, while the head and forward legs form the foot and heal respectively. The basic weapon of the Spirit King Megazord is the Spirit Blade, a giant two handed sword, supported by energy beams from the Spirit Kings’ helmet - specifically the lions eyes. The Scarabs shell becomes a Spartan Shield, under the shell is a folded spear and a new helm. The basic Spirit King Megazord head fold down and rotates into the chest of the Lion Zord, a basic head rotates out. The helm covers the new basic head. The right hand carries the spear and the left carriers the shield. The Scarabs feet fold flat under the carapace and the entire Zord mounts to the back of the Megazord. The carapace contains powerful thrusters that the Stone king Megazord uses for powered skate attacks. Its final move is a charged shield power ram. The Shield can block attacks and be used to ram or impact enemies. The spear can be used to strike and pierce or can be used as a thrown weapon - one shot unless retrieved! The Lake Turtle has a massive heavy cannon mounted on its shell turret. The cannon disengages from the turret, the muzzle extends and a small pistol grip/handle folds out from the bottom. The cannon mounts to the Megazords right forearm, with the right hand gripping the pistol grip. The cannons radar dish and other technical components remain in place underslung on the cannon. In the belly of the Lake Turtle Zord is a new helmet for the Megazord that resembles a military combat helmet. The feet of the Lake Turtle Zord fold into the main body, with the remainder of the zord mounting to the back of the Megazord. The Lake Turtle Zord becomes a massive reactor for the cannon, swirling energy can be seen flowing inside the Lake Turtle - through small view ports (blue/white colour to the energy - same as the cannons attack energy colour). Power cables snake out of the Lake Turtle Zord to connect it to the cannon. Final attack is a massive energy charge, able to reach long range and pierce most targets. Even normal charges will often pass right through a single enemy to strike additional enemies behind them. The Sky Falcon Megazords claws separate from the zord and mount on the forearms of the Megazord, giving it powerful melee rake attacks. The head of the Sky Falcon Zord separated and becomes a new helmet for the Spirit King Megazord. The main body of the Sky Falcon Zord folds down and mounts on the back of the Spirit King, giving the new combined form the ability to fly. The Wings are mounted vertically on the back in a semi open position when not in use, when flying the wings fully extend. The Sky Falcon provides a few new attacks for the combined megazord, powerful rake attacks with the clawed ands and "Wing Blades", dozens of feathers shoot out from the wings like razor darts. The Final attack transforms the entire zord into an energy bird that shoots through its enemy target then reforms on the other side. The Legacy Megazord combines elements from all three secondary Zords. The Cannon from the Lake Turtle Zord mounts onto the right arm as per normal. the wings and body of the Sky Falcon Zord mount to the back of the Megazord, the wings however rotate up and over the shoulders of the Megazord to rest parallel to the ground (as opposed to vertically). The thruster assembly from the Scarab Zord mounts to the back of the Sky Falcon zord. A new helmet "appears" for the Legacy Megazord to wear. The Legacy Megazord is able to fly, however it remains vertical when doing so, instead of flying in a prone position. The cannon can rapid fire or super charge as per normal, however the energy output is more yellow-orange-red. The thruster assembly allows the Legacy Megazord to fly, charge and maneuver more gracefully then any prior combination. The Final attack is a spirit charge to the main cannon. When discharged, not only is a powerful red-yellow-orange energy discharge visible, but ghostly outlines of all eight zords - the spirits of the zords swirl around the energy beam. The final strike first hits with the main energy discharge (one explosion) with eight secondary discharges (eight more explosions) as each spirit zord strikes the target. The Triskelions are a collection of ancient Alchemists who used their power for selfish reasons. Rhyv, the leader of the Triskelion's developed a special alchemy transmutation that transformed the group for normal humans into the monstrous forms they have now. Rhyv convinced the other members of the Triskelion to discard their humanity for power and immortality. What the rest of the Triskelion do not know is that Rhyv plans to sacrifice them in order to gain god like powers. Rhyv - The de facto leader of the Triskelion, currently imprisoned within Zero Space. Rhyv is brilliant, cunning and completely insane. he is driven by his goal of immortality and godhood. He is willing to consume all live on earth in order to accomplish this task. Outwardly he is charismatic, calm and reasonable, when enraged he loses control of his emotions and transforms into a rage driven insane monster prone to extreme violence and cruelty. Verys - Verys is the second in command of the Triskelion and the acting commander in Rhyv's absence. He believes in what the Triskelion are doing and is just as dark as his master, although he has no clue as to Rhyv's ultimate plans. Verys is arrogant and psychotic. He believes that the Triskelion are superior to all other life forms. He is cunning but lacks subtly. His tactics can be brilliant, but he has a habit of sacrificing lesser beings to accomplish his goals. The only beings he values are the other members of the Triskelion. Irremais - Like a Black widow Spider, Irremais is seductive and deadly. She believes in Triskelion superiority even more than Verys. She is somewhat hyperactive and fidgety, always on the move and never sitting still. In combat she is cruel and merciless, but she does not like to kill without good reason. To her way of thinking each life taken is a waste of food/resources. Ophillum - The youngest of the Triskelion and in some way the most dangerous. Ophillum has the self restraint of a child, prone to out of control tantrums and fits of rage. Ophillum believes in his own personal superiority, even above the other Triskelion. This feeling of infallibility leads him to take dangerous risks and place those under his command in harm’s way far too often. He is cruel and malevolent, often taunting his enemies just before delivering the killing blow. He is dangerous, arrogant and completely amoral. Yoorin - When not engaged in battle Yoorin is quiet and reserved, speaking only when necessary. In combat she acts like a child playing with their favorite toy. She views life in general and humanity specifically like ants, she has no compunction about slaughtering them wholesale in the most vile ways imaginable. Bravash - A natural born warrior! Bravash prefers personal melee combat to the "less honorable" methods of the other Triskelion. While just as corrupt and evil as the others, Bravash operates within his own personal "code of honor". He has been known to let an injured opponent live so that he may face them again when they are at their best, just so he can satisfy his honor. Of all the Triskelion, he is the most patient and reasonable. Gralm - Fiercely competitive and driven. Gralm angers extremely easily when things do not go according to plan. She prefers hit & run tactics over brute force. She employs speed and stealth in bother her tactics and personal attacks. Gralm desperately want the attention of Rhyv, she will betray or sabotage the other Triskelion in order to make herself look better or them worse in his estimation. She secretly loves Rhyv as much as she is capable of love. If Rhyv ever discovers her true feeling toward him, he will be reviled and disgusted by her human weakness. The Haploids: Triskelion foot soldiers - Haploids are an artificially created Golem creature developed by the Triskelion. They are grown vast numbers inside of test tube like chambers. When needed the Triskelion hatch a squad of troopers. They are simple minded and completely loyal, accepting any order they are given. Haploids are armed with a variety of melee weapons ranging from simple swords to spears and protected with a single piece of formed chest armor. They Haploids are blue-white-grey in colour and have a featureless face. The true power of the Haploids come from their limitless numbers and single minded obedience. The Zygote: Triskelion Monsters - When the Triskelion require the services of a more powerful minion they transmute a Haploid, fusing it with animal DNA (living or fossilized). Haploids that undergo this transmutation develop animal characteristics based on the DNA they have been combined with. Examples of some changes include claws, scales, feathers, teeth, tails, additional appendages, body armor, spikes and more. Triskelion Zygotes are still obedient to their masters, but posses a independent personality and intellect. They are able to adapt to combat and make their own decisions, unlike the Haploid foot soldier they evolved from. The transmutation process typically infused unique powers into the Zygote, elemental control, directed energy attacks and advanced melee abilities are common mutations. When damaged or destroyed the Zygote become molecularly unstable, a side effect of the transmutation process. This same instability can sometimes be artificially induced but the result is the same, an irreversible growth of cells causing the Zygote to increase its size and mass. Within seconds a damaged Zygote can transform from a normal sized creature to a towering giant. Raido - (Megalara Garuda) -The "King of Wasps"
TechnoForce Red: The leader. Red is the most well-rounded and least conspicuous when un-morphed; he's got a pretty good understanding of things the vast majority of the time, though he has no problem with deferring to Blue's wisdom when the need arises. Often finds himself apologizing whenever Yellow forgets about the whole "personal space" thing or does something else weird. Often worries he's "trying too hard" to blend in with humanity when unmorphed. TechnoForce Yellow: The happy one. 99% of the time, she's smiling; if she's not, something's REALLY wrong. Think "keet" rolled up with a side of "genki-girl", and you've got Yellow. Yells "AH-YAH-YAH!" (go watch the saloon escape from The LEGO Movie to know what it sounds like) in battle, and on other random occasions. When not morphed, she goes out of her way to try and make new friends (Gentaro's got nothing on her! ), and often forgets about things like personal space or that people don't like it when you smell their hair. TechnoForce Blue: The smart one. A bit less social than Yellow or Red when unmorphed, she still finds time to hang out at the library and check out books on subjects that fascinate her (aka, all of them). Tends to be the most blunt and technical of the group when explaining things to civilians, which occasionally leads to her giving disturbingly direct bad news (and Red apologizing for it). When she's not at the library, she's either at the arcade or the gym---the former, to look out for trouble; the latter...to look for potential dates/"research subjects" (and by "research", I mean people to test her attempts at cooking---if you're going to blend in with humanity, you have to know how to make food that won't send people running to the bathroom, right?). General Xanvire: Basically, think of Delu-Knight, except constantly pissed off and shooting mooks in the face (or stabbing them through the face) whenever they screw up. The DEFINITION of no indoor voice. The only person he doesn't scream at is his superior---everybody else gets to learn the hard way why earplugs are mandatory for mission briefings. Has a zero-tolerance policy for failure---and if the mooks cause HIM to screw up, then it's bye-bye minions. Refuses to adopt any human disguise, and often destroys doors with his sword (or punt-kicking mooks through them) instead of just opening them. Last edited by DukeNukem 2417; July 26th, 2014 at 06:41 AM.